Blue Lake was gorgeous this am. 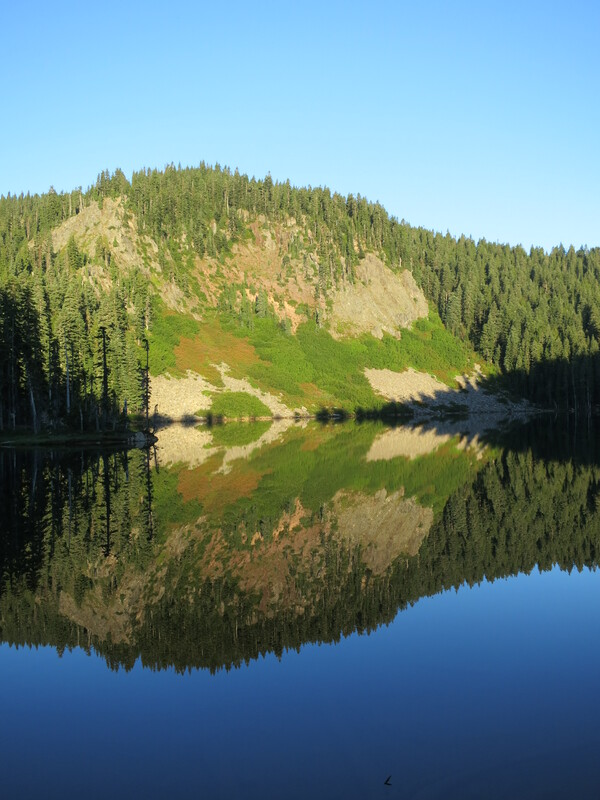 Perfectly flat, with blue sky, and picture-perfect reflection. It was just the morale boost I needed, as I had been pretty down. And a thru-hiker named Leonidas stopped by my camp on his way north. Most excellent trail name. This style of sign is also used in Indian Heaven, and was just above my campsite. After washing out my socks and hanging them on my pack, I hit the trail. It was a relatively flat day, finished by a gentle downhill, and that really helped my mood. I need to ditch more weight to find that sweet spot, but it’s in sight. – Stopped at Deer Lake to backflush my filter, after the gick in Blue Lake. 2 days of silty lake water took its toll, but it’s fine now. – Met Ronny, a local who loves to fish these lakes. He remains amazed at how few mosquitoes there are in the Indian Heaven Wilderness. It’s notorious for the overwhelming clouds of vicious bloodsucking doom. – Met a family of four, up for day hikes, and chatted while they had their lunch. I got two baby carrots. My heavens, they tasted good. Lighthouse had just been there and Yogi-ed some celery. To Yogi means to look pitiful while non-backpackers are pulling out their vast quantities of food. I think I’m getting the look down. – Met two retired men out for a day of berry picking. – And met Acorn the Elder, a thru of about my age. He’s sporting a decrepit blue Ensolite foam pad, which he found at South Lake Tahoe; just seeing that pad brought back quite a few memories, and sparked a great conversation. More spectacular lake scenery, this time from Deer Lake, where I stopped to filter water. And again, Deer Lake. The lighting was incredible. The old school PCT emblem can occasionally be found. Hiking through the northern Indian Heaven area. Closer still, with weather on the top. Once again I’m sharing a campsite with Warden and Firestarter. We’ve hit it off well, and because we’ve got a similar itinerary, we’re doing everything together except the actual hiking. After dinner we were joined by Roller Girl and Pilgrim. They’re SOBOs and had lots of good info for us. I love this part of being on the trail. RG and Pilgrim were great. They both got out of the army recently. Pilgrim did the AT last year and the PCT this year. He’s doing a yoyo and that’s where he met RG. We had an awesome time, the five of us.